…to those new readers and I hope you will find my blog informative, helpful, friendly and at times maybe even a little entertaining. Craft/hobby supplies that you used to enjoy using but haven’t touched in ages. Bits and pieces of things that you swear you are going to make something out of. For example computer parts. The broken down old car in the back yard that has been sitting there for years. A shelf full of cookbooks that are only gathering dust while you cook the same old favourites that you know the family loves and you could make with your eyes shut. Books piled up on shelves that you read years ago and keep for the day you are inspired to read them again. That boat in the shed that has been rotting away while waiting for you to retire by the lake. Sporting equipment for a sport you think you might want to take up again when you have more time. Clothes you will fit into again when you lose that 20lbs you gain when 5 year old Johny was born. …all of which are likely to be one or all of the following ~ out of date, out of fashion, perishing, collecting dust, wasting space and worst of all causing you angst. When these items come into your field of vision they usually make you cringe either because of the money you have wasted on them, the disappointment in yourself for not living up to your own expectations or frustration from not having the time or energy to devote to them and knowing that you probably never will. In some cases these items represent an interest that although you had an idea to dabble in you really didn’t have the aptitude for. My first advice is don’t be too hard on yourself and also don’t ever let this situation deter you from aspiring to other dreams in the future. My second piece of advice is to make a calculated choice as to what unsettles you the most, the thought of decluttering these items or thought of continuing to live with them cluttering up your home. What is greater, the chance that you are never going to use them or the chance that you are going to regret getting rid of them? Can you perhaps downsize your collection and see how you feel about that rather than getting rid of it all in one fell swoop. If you find yourself on the fence, so to speak, not able to make a decision one way of the other perhaps it’s time to enlist the opinion of those close to you. Your wife may have been biting her tongue for months/years waiting for you to remove that eyesore from the back yard. You husband is secretly delighted that you might finally declutter your craft supplies and free up some space so he can reconfigure his well used office area. The kids will be so relieved that all that junk is out of the garage and they can get in and out of the car without worrying about scratching the paint on the doors. The thought that one choice could bring pleasure to someone you love may just make the decision a whole lot easier. Finally, if you do decide to declutter don’t be too hard on yourself, don’t dwell on guilt, regret or disappointment. Rejoice in the fact the you have added tranquility to your surroundings, relief from unfulfilled aspirations and the freedom to open your mind up to new pursuits. With a little effort you may be able to find a new owner for you stuff who will immediately use and enjoy the gifts you bestow on them. The lesson for the future is to try before you buy next time. Make sure you are ready, willing and able to enjoy the next pursuit you aspire to before equipping yourself for it. And even when you are sure, make certain to only take on enough supplies/equipment to enjoy the pastime without it taking over your life and space. Some of these old records have been with me for thirty plus years and most of them haven’t been played for about twenty years. I am not sure why I have hung on to them for so long. I am sure most of them are available on CD or can be downloaded to iPod and lets face it we decluttered the record player back on day 150 of my challenge back on May 30 last year. Although I am writing this post in advance I know that today I am going to be grateful and relieved that my live-to-air radio experience is now in my past and that anxiety is out of the way for now. I hope that I have proved to myself I can handle a situation like that just in case I am called upon to do it again in the future. This is my decluttering roadblock. I can relate to the idea that trying to sink your creativity into a pass-time can be very difficult when you have little children demanding your attention. When my children were little I hardly touched my sewing machine because if my concentration kept being interrupted I would make mistakes which caused real frustration. Once they were in school I got back to the machine again and made school clothes and other items for them. I suppose the key to not compound the problem by starting one new craft after another. Sometimes dreams of doing something don’t turn out to be all that great in reality and there is nothing wrong with the. Just move on.There is nothing wrong with trying something and then deciding that it isn’t for you but it is best not to buy too many supplies until you are sure you are really going to sink your teeth into it. Second, several years ago, I asked my mother for four cross stitch patterns and the linen fabric to go with them. The pictures are of Celtic princesses and there is one for each season. I made the “Winter” one (I don’t know why – I hate winter and the colors are the least pretty of the four). I have the remaining three patterns and really want to finish the series. The problem is that it cost me over $200 to get “Winter” framed and I do not want to put a total of $800 into framing, assuming I would actually ever finish these projects! I cannot bring myself to get rid of these and I cannot stand the fact that they are sitting in my cupboard. They aren’t bothering anyone where they are, but they are always in the back of my mind. I think I would regret giving them away, but I don’t know if I will ever finish them and, if I did finish them, would I really want to pay to have them framed? This is why I said “ouch.” When I saw what you were going to post, my mind went to these patterns and supplies immediately. I bought everything I need to make all of them. Money spent – a LOT of money. A hobby I really enjoy, but don’t do nearly as much of as I used to because of my pain condition and other pursuits like writing. This is a constant, nagging, back of my mind thing that I cannot make a decision on. Oy. Thanks for giving me something to think about. I have gotten rid of the quilting supplies by giving them to my mother. She is a quilter. But I still have all of the unfinished and unstarted cross stitch projects and don’t know what to do about that! Could you try to find someone who does framing as a second source of income? – they might charge less. Or, check the internet and learn how to do it yourself. I don’t envy you this decision! being as you are still on your declutter journey maybe it is best to leave them in the cupboard like you suggested until you are good and ready to deal with them. Focus on something else in the meantime. Ok, wowsa. I have to agree with Chelle on this one…***OUCH***!!! this isn’t about decluttering things you don’t want to this is about admitting to yourself whether you are really going to get about doing these things that are hiding away somewhere. Or are these things just haunting you with their silent taunting. p.s. OMGoodness Colleen!!! Those albums really gave me a grand ole laugh. 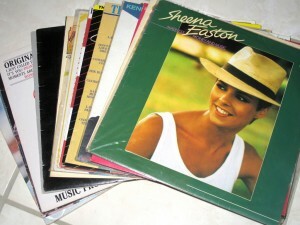 And Sheena Easton to boot!! Ok, seriously??? There is a hamburger joint in Arizona that has old album covers all over the walls. It really is a blast to go there just to gaze ones eyes over all those albums covers!!! Oh, hello memories!!! Every other kind of decluttering I can do, usually with ease, but would you believe that I’m STILL having trouble deciding what to declutter out of my art supplies? I know you’ve written about this at least twice; that’s why I say I’m “still” procrastinating. I do a lot of collage and altered art, so you know that just about *anything* that passes through my hands could be good for collage fodder. I really need to get it thinned out though, now that I do mostly digital art. I have written about this at least twice and every time you tell me you are going to deal with your collage clutter. What a pair we are, I still have plenty of papercraft clutter to but I am slowing working on it. Perhaps if you don’t think about it as one big job but just sort through a little at a time. Pick out the bits that you like the least and then come back to again later when you are ready to have another shot at it. At least then you will feel you have been doing something. Too funny! This week I purged albums too. And several trash bags of VHS tapes; heaven knows what kind of movie viewing technology we’ll have whenever I have grandkids; I do know it won’t be VHS though. Congrats on your radio interview! I was very pleased with the way the interview went although I haven’t had a chance to hear it back yet. VHS is already a thing of the past, they aren’t even making VHS players anymore. I guess that’s why I still have a VHS player tucked away in a closet; we still have a few VHS tapes that are of very sentimental value- videos of our son thru out the years. One day they will be converted; but until then the few tapes will remain and I have no problem with what little space the old player takes. we gave ours to a friend who needed it for a conversion project. We still have a boxed set of 20th Anniversary Star Wars movies in VHS perhaps it is time we gave some thought about what to do with those. You were brilliant Colleen! You have some great tips and I am grateful for the opportunity of working with you! You can hear the interview again here. thank you so much. I have only just arrived home so I haven’t had a chance to listen to it yet. It really was a pleasure to meet you and I sure intend to stay in touch. You made me feel so at ease in the studio with your wealth of knowledge and your friendly manner. What a great interview Colleen! I thoroughly enjoyed it. Just listened to the interview – what a great job by both ladies. A lot of good points were made and it was good to hear the callers bring up different points as well. Well done; you are getting helpful information out to people who need it and hadn’t yet been lucky enough to find your blog, Colleen. thank you for that. It was really fun actually and Sara, the professional organiser I was on with was great. She was so friendly and knowledgeable and made me feel at ease from the minute she introduced herself. I can imagine her being a great help to her clients. I am struggling with this. I have not gone horseback riding since I had surgery 2 1/2 years ago but since I had only returned to doing it for about 6 months and I really loved it I am having trouble letting go of my boots & helmet. Other potential hobbies also cause this problem. Sigh. I understand your trepidation especially when circumstances have made it difficult to resume a much loved hobby. As I always say in cases like these, save that decision for later on and focus on the things you are more sure about for now. Hi Colleen. Loved to hear your voice. Great interview. Here’s a thought that really helps me when I’m struggling with getting rid of aspirational clutter: Think how excited someone would be to find this secondhand! Paints, fabric, canvas, tools, equipment–whatever your hobbies (or ex-hobbies), the materials can be expensive. How delighted would a novice golfer be to find your old clubs at a thrift store? How excited would an art student be to find your culled brushes and paints for 80% off the retail price? By donating all of the supplies from my unmet goals, I can help someone else meet theirs. It makes it much easier to take that bag to the charity dropoff. what a positive attitude to decluttering aspirational clutter. Don’t think of it as a failure on your behalf but as a benefit to someone else who has a passion for whatever the pastime might be. Maybe this is how this was supposed to play out. I’m reading this well after the other posters but since I am decluttering craft items, some of the comments really hit home. I have a friend who is always doing/starting another project and for a few years, I was sucked in. Now, I know I could have said no but it’s really fun to do something with a friend and I would buy all the project tools, fabric, yarn, etc. making one or a portion of one and then leave the rest undone. I was sick a few years ago, so my friend and I decided to do some latchhook projects while I was off from work. My son and I did one together and we started another – it happens to be 48″ by 30″ and is still only about 1/3 done. It’s really too big and hot to work on in the summer but I do work on it in the winter. My son has moved out so it’s my project. But, I found a latchhook flag, a Latchhook bear (cut out to look like a real polar bear and several other small projects in my craft room. Everytime I look at them, I feel guilty because I spent the money for everything and never got around to doing them. And, it’s not like they are hard, just time-consuming. One day soon, I will just donate them and like okgirl said – someone else will enjoy finding a new project for very little money and I can move on to the projects I really want to do. Reading this today was great timing. Not sure if all will go this weekend, but will think strongly about passing on some of them.